Warm yourself with My Art! My artwork also stands out wel on all kinds of blankets, my artwork is also printed on fleece blankets. I leave the printing to Fine Art America, they do a fantastic job of printing on soft fabric. What fun it is to warm up with a beautiful fleece blanket with my exclusive and happy art. Put a smile on your face, and warm yourself with my artistic fleece blankets. Fleece Blankets, also do very well as a gift for a loved one. How special is that, an artistic fleece blanket with your favourite artist's work on it. All fleece blankets are of outstanding quality! Soft, 100 percent polyester in two sizes: 50x60 inch and 60x80 inch. Each fleece blanket is machine-washable in cold water and tumble dry with low heat. The fleece blankets come in two styles: plush fleece and sherpa fleece. Plush fleece is soft and fluffy on both sides. Sherpa fleece is smooth on the artwork side, like a sweater. Sherpa fleece provides a sharper image as the threads are shorter. The above fleece blankets and much more home decor products can be ordered through the Fine Art America widget above or through my Fine Art America website. 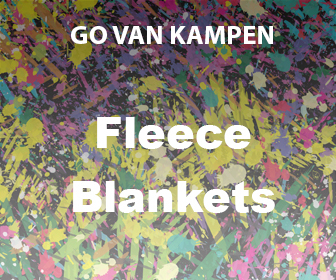 You can choose from fleece blankets, plush or sherpa style with an exclusive art print of Go van Kampen. All fleece blankets are of high quality and produced using the latest printing techniques for fabric. Simply use the Fine Art America widget above, to buy one of my Art Blankets or to just continue shopping in my Fine Art America webshop. At Fine Art America you can pay securely by Paypal or credit card. Delivery of ordered products is between 3 to 4 business days and you have a 30-day money back guarantee.